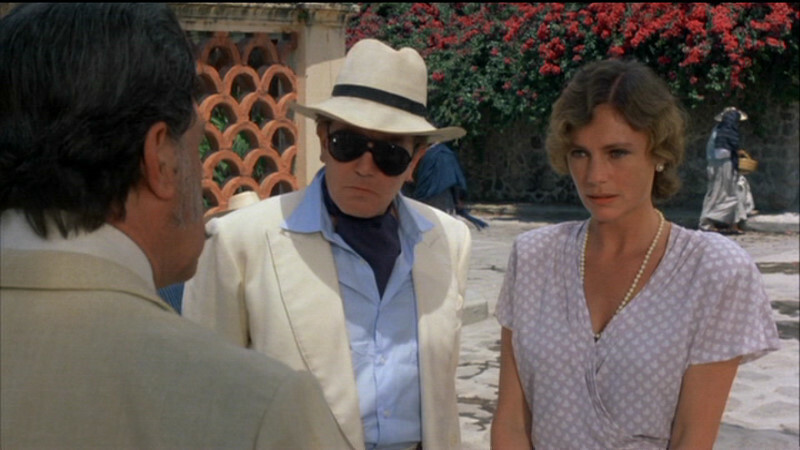 In Under the Volcano, we don’t know why Yvonne Firmin (Jacqueline Bisset) has come back to Mexico to reconnect with the husband she at one point seemed to determine to leave behind. Her motives are never articulated–especially to her mate, Geoffrey, who spends much of the film practically convinced she’s an apparition. I haven’t read the Malcolm Lowry novel upon which the film is based, but perhaps a less literal director than John Huston may have played with that sense of unreality a bit more. After all, the film takes great pains to provide us with an early scene in which Geoffrey (Albert Finney, raging at his helplessness) is dragged to a church to pray for her return from America. The morning after, when Geoffrey, still drunk, still in his clothes from the night before, dissembling to an uninterested few about his past adventures, first spies Yvonne in the doorway, resplendent in morning light, he turns away. He’s convinced she isn’t real, while a local doctor believes she is a product of the divine. Geoffrey will spend much of the rest of the movie denying that she’s there in body at all–and more than that, he’ll resist at every juncture the idea that she could be there because she does indeed love him. Is she and does she? Again, Huston doesn’t have much fun with that idea. (Although go too far and you have Inception. Or Solaris. Or, groan, Shutter Island.) If the movie, like the novel, were told entirely from Geoffrey’s point of view, we might wonder. But Huston painstakingly gives us asides featuring Yvonne and Geoffrey’s half-brother, Hugh, that make it clear that she has come back to Mexico for her husband. I suppose that makes the story more of a tragedy–that Geoffrey is so far gone, so possessed by the bottle, and so shackled by his weaknesses, that he can’t reclaim his life with Yvonne even as he desperately wants to–but an alternative version might be that she left long ago, a prophet of his descent, and that her change of heart is his late-night drunken fantasy. Those can be as real as anything. Huston instead positions Yvonne for much of the film as Sera was in Leaving Las Vegas, the faithful, unquestioning, standby, watching until the bitter end, choosing perhaps not to intervene in some strange hope that peace will be the result. The final act, however, seems to want it both ways. That which will be will be. As Geoffrey tumbles into the hellish swirl of a cantina and whorehouse, he appears to lose his final tether to reality and film teeters on the edge of a dream along with him. The sequence in which he finally reviews Yvonne’s letters, in particular, has a feverish, account-settling surreality to it, as if his life is flashing before him in hand-written cursive. That mood extends to the much-maligned ending, where both estranged lovers fall in a machination worthy of Shakespeare (who did it better). The choice propels the film further into the realm of allegory, yanking us farther away from the questions that Huston seemed, earlier, had wanted us to ask. Why did she come back? Why did she still love him? And why was she so powerless to stop him?